WASHINGTON The United States spends more than other developed nations on its students' education each year, with parents and private foundations picking up more of the costs, an international survey released Tuesday found. 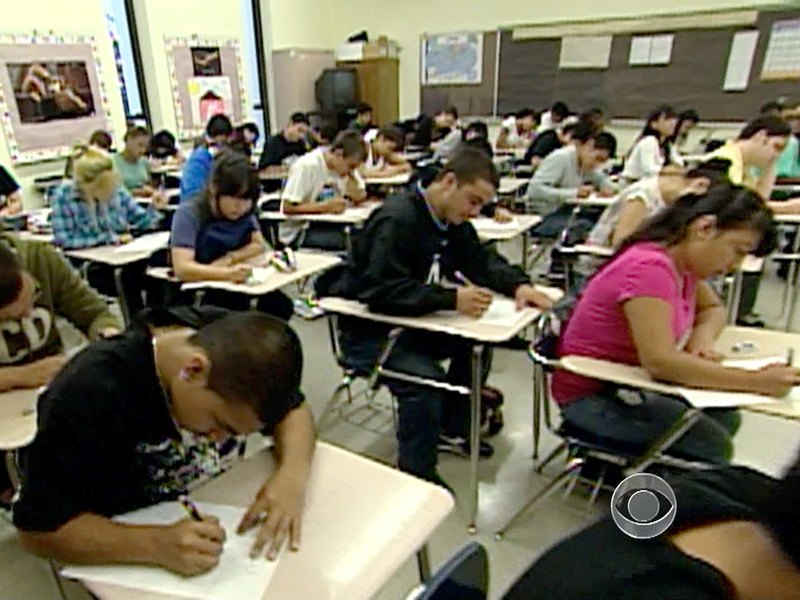 Despite the spending, U.S. students still trail their rivals on international tests. The Organization for Economic Cooperation and Development  which groups the world's most developed countries  writes in its annual report that brand-new and experienced teachers alike in the United States out-earn most of their counterparts around the globe. But U.S. salaries have not risen at the same pace as other nations. The findings, part of a 440-page tome of statistics, put the United States' spending on its young people in context. The United States spent more than $11,000 per elementary student in 2010 and more than $12,000 per high school student. When researchers factored in the cost for programs after high school education such as college or vocational training, the United States spent $15,171 on each young person in the system  more than any other nation covered in the report. That sum inched past some developed countries and far surpassed others. Switzerland's total spending per student was $14,922 while Mexico averaged $2,993 in 2010. The average OECD nation spent $9,313 per young person. As a share of its economy, the United States spent more than the average country in the survey. In 2010, the United States spent 7.3 percent of its gross domestic product on education, compared with the 6.3 percent average of other OECD countries. Denmark topped the list on that measure with 8 percent of its gross domestic product going toward education. Spending, of course, only tells part of the story and does not guarantee students' success. The United States routinely trails its rival countries in performances on international exams despite being among the heaviest spenders on education. U.S. fourth-graders are 11th in the world in math in the Trends in International Mathematics and Science Study, a separate measure of nations against each other. U.S. eighth-graders ranked ninth in math, according to those 2011 results. The Program for International Student Assessment measurement found the United States ranked 31st in math literacy among 15-year-old students and below the international average. The same 2009 tests found the United States ranked 23rd in science among the same students, but posting an average score. And it's not as though all spending on education is public, the OECD report found. Public spending accounts for just 70 cents of every education dollar in the United States. Parents picked up another 25 cents and private sources paid for the remainder in 2010. A decade earlier, the public's share of education spending was 72 cents on every dollar. The average OECD nation spent 84 cents of every education dollar, down from 88 cents a decade earlier. For post-high school programs, the United States is far outspent in public dollars. U.S. taxpayers picked up 36 cents of every dollar spent on college and vocational training programs. Families and private sources picked up the balance. In other OECD nations, it was roughly reversed: The public picked up 68 cents of every dollar in advanced training and private sources picked up the other 32 cents. "When people talk about other countries out-educating the United States, it needs to be remembered that those other nations are out-investing us in education as well," said Randi Weingarten, president of the American Federation of Teachers, a labor union. Still, teachers in the United States fare fine. The average first-year high school teacher in the United States earns about $38,000. OECD nations pay their comparable educators just more than $31,000. That trails Luxembourg, which pays its first year teachers more than $72,000 a year, but far exceeds the $10,000 paid to first-year high school teachers in Slovakia. Among all educators, U.S. payrolls are competitive. The average high school teacher in the United States earns about $53,000, well above the average of $45,500 among all OECD nations. Even so, other nations have increased teachers' salaries more quickly than the United States, which has been confronting tighter budgets as a result of the economic recession. "Teachers' salaries represent the largest single cost in formal education and have a direct impact on the attractiveness of the teaching profession," the report states. "Since compensation and working conditions are important for attracting, developing and retaining skilled and high-quality teachers, policy makers should carefully consider teachers' salaries as they try to ensure both quality teaching and sustainable education budgets."